The universe conspires to keep us on our windy, wily way to all it wishes for us. Often, life feels like a pattern of wild goose chases, flocking to the death of my latest dernier cri. This morning, while sobbing to a dear friend about diversions in my effort to be diligent, she reminded me of lessons leveled and learned in each feral chase. When the dream dries up and we're left in that uncomfortably expansive desert, can we remember there is gold to be gotten in the tangents? Sought at the bottom of a rainbow. Found hidden in the ditch of a dead end road. This week is a procession of release, lead by Lady Lunar Eclipse, renewing hope in the sign of Aquarius. Mid-week, the Sun inconjuncts Pluto, flashing light on alternate paths to profound transformation, bolstered by wisdom from gentle Jupiter. Mercury and Venus host an emotional heart-to-heart before the messenger hits the rewind button this weekend, stationing retrograde while the love goddess makes liquid lust to Neptune. Sit still for sparks between the Sun and structured Saturn, promising a pretty performance with a plainer perspective once all the players have made their move. Death is gentle but swift. Difficult to see, like a hummingbird, stunning as a soft sunset when your eyes catch the flutter of her wings. Virtually weightless yet leaden with powerful magic that lifts burdens from our backs when we are too emotionally burned to bear the brunt of untangling ourselves. She pries our hands from the hearts of others and cups our flushed red skins in her palms with care, five pointed stars reflected out of eyes too awestruck to take that first bite of Eve’s apple. Aspects this week inspire desire to hold on for dear life. 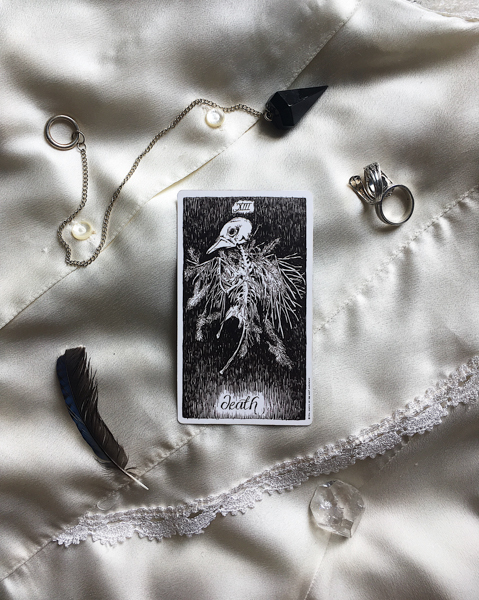 Death teaches us to trust fall, stands below the beam and eggs our egos off with open wings ready to wrap us in the relief that follows our release, removing roadblocks when we become willing to get out of our own way and let go.